Queer Eye returns in February 2018. Long before queer became the go-to descriptor for millennial dating app profiles, there were the five fabulous men of the Emmy-award winning series, Queer Eye for the Straight Guy. Now, like Britney Spears’ career, the show is making a comeback. Netflix has announced today that Queer Eye is back and packing up for a move from New York to Atlanta, Georgia. As the new Fab Five navigate a new world and new community, they’ll “forge relationships with men and women from a wide array of backgrounds and beliefs often contrary to their own, touching on everything from LGBTQ rights and social commentary to how to make the best farm-to-table guacamole and more,” a press release notes. 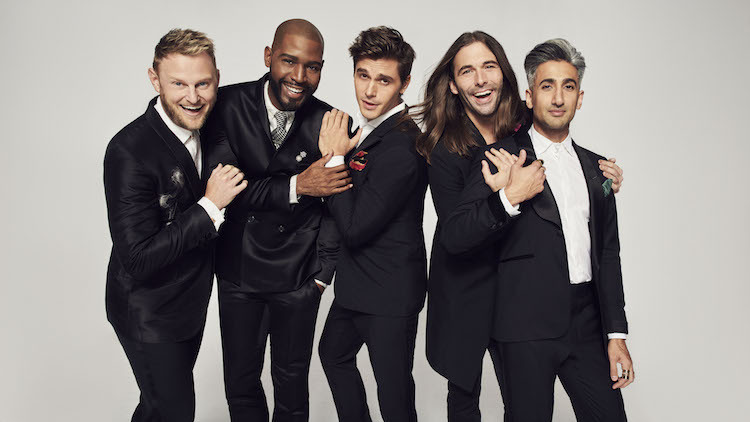 Replacing the original Fab Five crew of Ted, Kyan, Jai, Carson, and Thom, the Queer Eye’s new Fab Five are a diverse group of fabulous experts on everything from grooming and fashion to food and wine. As we wait impatiently for the new season to hit the streaming service in February, whet your appetite with a bit of information about the new crew. After working as Creative Director at Portico Home & Spa, he launched Bobby Berk Home and opened a SoHo showroom, which led to showrooms across the country and the launch of Interiors + Design, a specialty interior design service. She’s busy! Don’t let the last name fool you, France is English! This modern gentleman is the creative mind behind brands that include Kingdom and State. Before all that, though, he spent his summers working in his grandpa’s denim factor and secretly enrolled in fashion college before finally coming out to his parents as a design star. Is there anything Karamo doesn’t do? The single father of two is the founder of the HIV awareness organization 6in10; was the first openly gay black man on MTV’s The Real World series; hosted a series for Oprah Winfrey; and engaged in policy discussions about LGBTQ issues during the Obama era. After training at the Aveda Institute of Minneapolis, he moved to Los Angeles and worked at the renowned Sally Hershberger salon before finding an entirely new audience on the web series Gay of Thrones, which went on to get nominated for an Emmy award. This connoisseur has served as the personal chef for original Queer Eye star Ted Allen, but he’s ready to take the apron and serve up a new selection of dishes on the reboot. The self-taught chef graduated with a degree in psychology that helped him hone his underlying philosophy that food should tell a story because the heart and stomach are interconnected. We’ll drink to that!